Each order is custom built whether it is using moisture proof boxes, wooden crates, or reusable boxes and going around the world or across America. Our team ensures your packing is done in the most reliable and cost effective way possible. Relying on our expertise since 1968, our satisfied customers include major companies in manufacturing and petroleum-related industries. 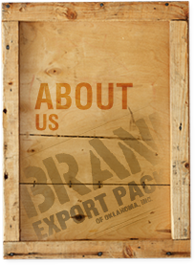 Brand Export is located near the Tulsa International Airport on five fenced acres. We have over 28,000 square feet of offices, manufacturing and warehouse space which is secured with lights and a monitored security system with video cameras. Customer goods are handled with 10 lifts with a maximum single lift capacity of 52,000 pounds. We have 6 trucks with a maximum hauling capacity of 48,000 pounds per load.